The amenities at Splatball located in Minneapolis make it one of the best indoor paintball fields in Minnesota. Established in 1984, Splatball is one of the oldest indoor paintball fields in the country. Splatball is located off of I-94 just north of Minneapolis, making it an easy drive from anywhere in the Twin Cities. It’s dedicated parking lot offers free parking to customers. As the oldest paintball field in Minnesota, we know how to throw a party! There isn’t another field out there that’s held nearly as many birthday or bachelor parties as us. When you first enter the facility, you’ll notice our paintball store, the largest in Minnesota. Our selection of new and used paintball guns gives customers a large selection of paintball gear for nearly any budget. We are an authorized repair center for Planet Eclipse and we stock their full line of product. Beyond the pro-shop is the check-in and staging areas. Our online reservation and waiver system gives customers the ability to reserve their session in advance and complete the required paperwork before arriving at the paintball field. Walk-on paintball sessions are also available for players who don’t want to make reservations, or would like to play with a larger group of players. The staging area is perfect for celebrating a birthday party or bachelor party. Customers are welcome to bring in cake and snacks or they can order in food from a variety of local restaurants. Just ask our staff for a list of local restaurants and pizza places. Complementary lockers and wi-fi are available in the staging area. The entire facility is climate controlled. 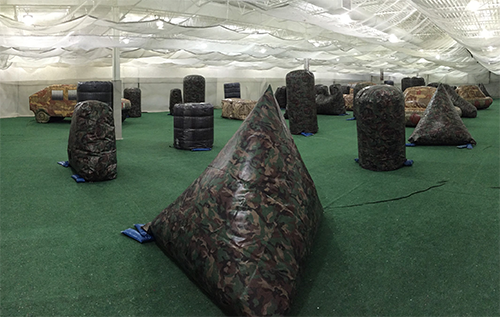 Air conditioning makes Splatball the perfect indoor paintball facility during hot summer days and our heating system is a welcome relief during cold Minnesota winters. The playing field is well-lit and features carpeting for an enjoyable experience. Our inflatable bunkers give players plenty of places to hide and also make it easy to change the layout of the field on a regular basis. Changing the layout gives returning players a new experience.